On the surface, NPS is just a number. But the value of a complete NPS program runs much deeper than the end number. By comparing NPS responses with other information, you uncover a wealth of information about WHY customers are loyal. Collecting consumer insights is just the beginning of the process. NPS should never be an anonymous survey. To get the most benefit, you need to know the customer behind each score. Collecting additional information – or better yet, collating results with existing CRM information – means you get a full picture of the type of customer most likely to be a promoter. Once you’ve got context around the customer insights, you can use extra information to segment your NPS and layer the data to give better insights. Here’re five ways you can use segmentation to glean advanced consumer insights into your NPS. What plan has the highest NPS? If you’re offering a freemium product, you might find that your free users are the happiest. This is a bad sign for future growth; if you keep attracting users that aren’t paying, your resources will be used up disproportionately. Instead, you want to continue turning your premium customers into promoters. If you don’t offer plans, try segmenting by customer value. Are the paying customers happiest? Do the reasons for their response change when the customers get bigger? Ideally, you want to make your most valuable customers the most loyal. If they aren’t, you need to dig into why – get more consumer insights. In addition to looking at what your happiest customers are paying for, you need to look at what they are actually doing with your product. Actions speak much louder than survey responses. How often are your promoters using your product? Is there a big difference between detractors and promoters? If you see an increase in NPS with an increase in usage, you’ll need to focus on keeping detractors and passives engaged. What features aren’t they using? You might see a trend in this article – it’s a lot of questions. But this is the way you need to think when you’re digging into your NPS results. Every trend you uncover will give you more questions and better consumer insight: Why do customers feel this way? Why does using this feature increase NPS? Using a product event tracking tool like Kissmetrics can help you tie events (things that customers do with your product) to an individual so you can build cohorts and start analyzing patterns in usage. Do customers get happier as their relationship with you grows? Or does the love slowly fade as time goes on? A cohort is a group of customers who all signed up at the same time. The graph below is a churn analysis down by the cohort. You can see how long it takes customers, who signed up in each month, to churn. Notice that, for this specific clients, there’s a significant drop-off for every group in the 7th month. 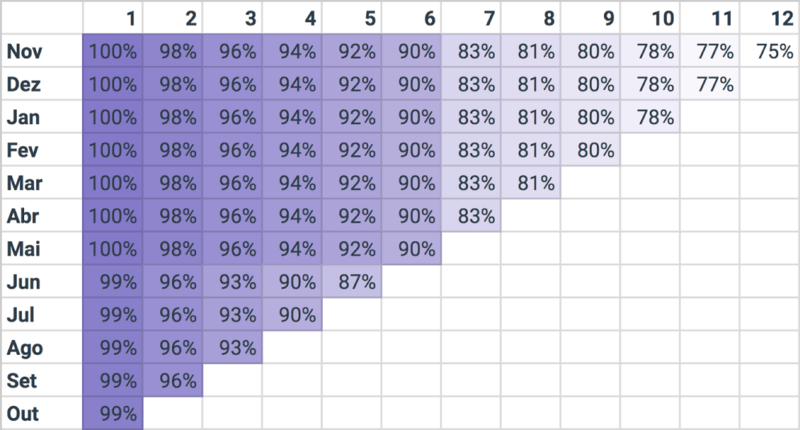 This great post by Guilherme Lopes explains more about cohort churn analysis. We want to do the same with NPS to see when customers are the most loyal. Take a look at the example below. You can see NPS peaks in months 4 to 7 and then starts declining. We can assume that most customers take three months to onboard and then start seeing more returns in their 4th month. What can we do with this information? We know that we should be approaching customers after onboarding for referrals and testimonials. We can also work on decreasing onboarding time and getting NPS higher earlier. For our older customers, why are they starting to become less happy? Are they growing out of our product? Or do they wait for more functionality add-ons? These are all the questions we’ll need to ask when we start digging into the Why behind older consumer insights. 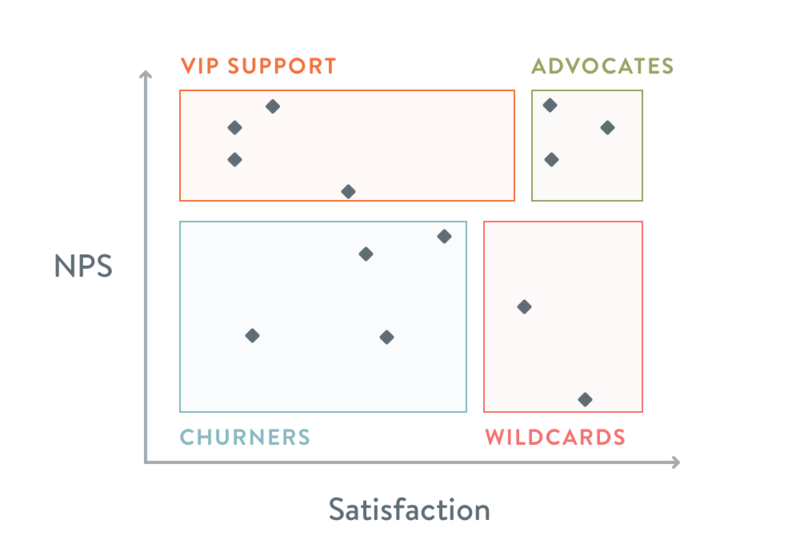 Does the quality of support influence your NPS? There’re two ways to dig into this question: The first is comparing customer’s Net Promoter Scores with their CSAT scores. If they consistently give bad customer satisfaction scores, and their NPS is low, you might be able to increase their loyalty with better support. Kayako wrote a detailed post about this exact process. You can see in the graph below. It shows how they’ve mapped their customer base by NPS and CSAT in order to see if customer satisfaction is driving their NPS trends. The other thing to look at is customers who’ve never interacted with your support team. Are the silent majority more or less loyal than those who’ve had a support interaction? It might be worth encouraging more customers to talk to support if they have a positive influence on NPS. Not all customers have the same requirements of your software. Often a manager or higher will have evaluated your product, decided to purchase and then rolled it out to their team. The everyday users don’t always have a say in what product they use, and they could be miserable while management thinks they are getting great results. It works the other way too: If the team responsible for budget doesn’t see a benefit to paying for your service, they might cancel the account, even if the users love it. 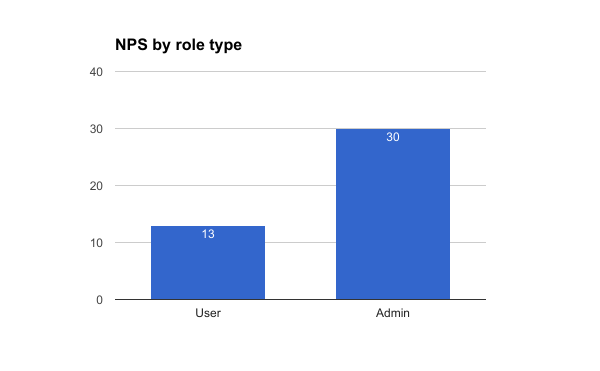 If you see a substantial discrepancy between user NPS and admin NPS, you might need to cater to one user group or the other. For example, admins need easy reports and the ability to prove ROI. If stakeholders aren’t able to see the value your product provides, they will be unlikely to renew when their contract is up. For users, focus on a smooth user experience and great support to keep them happy and using your service every day. Digging deeper into your NPS results will show you what you need to do to improve it. It will give you much more information about why your customers feel the way they do. There are probably a thousand more ways to segment your results for better consumer insights. As you keep asking more questions, a clearer picture will develop – and that clarity is the best reason to keep developing a better NPS program.